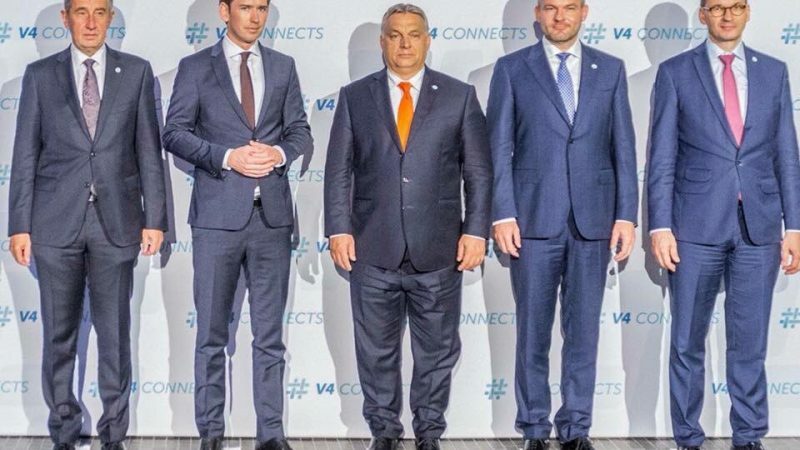 When it comes to migration and refugees, the Visegrad 4 governments speak with one voice: the EU should abandon any idea of a compulsory mechanism for refugee relocation. EURACTIV’s network reports. The numbers speak for themselves. The Czech Republic should have relocated 2,691 refugees from Greece and Italy. It relocated 12. Hungary should have accepted 1,294 people but allowed none in. Poland was to take in 7,082 refugees and hasn’t accepted any. Slovakia was supposed to relocate 902 asylum seekers. But it relocated 16 people – all single mothers with children. Viktor Orbán’s government in Budapest has gone further, erecting a 175-km fence on the Serbian border at the start of the refugee crisis in 2015 and then organising (and winning) an anti-quota referendum in 2016. Whatever the reasons, all V4 states ignored the EU quotas. As a result, the Czech Republic, Hungary and Poland were referred to the Court of Justice of the EU (CJEU) together for “non-compliance with their legal obligations” on relocation. Slovakia was let off because of the 16 relocated persons. The V4 countries all highlight the need to protect their national sovereignty, which they say the EU tries to infringe upon via compulsory quotas. And three of the four nations – Czechs standing apart – have demonstrated how they are virtuous voluntarily. Hungary hasn’t allowed a single person as a part of the EU scheme. However, the Fidesz government had granted international protection to around 1,300 asylum-seekers last year, most of whom moved on westwards. In the first four months of 2018, 267 asylum-seekers were granted protection, while 326 applications were rejected. According to former Polish Prime Minister Beata Szydło and her successor Mateusz Morawiecki, Poland has admitted more than a million Ukrainian refugees who fled the war in Donbas and the annexation of Crimea. Data from the Office for Foreigners (UDSC) doesn’t bear this claim out, however. “Currently 3,400 foreigners have valid residency permits due to the granted international protection. Additionally, around 2,300 have residency permits due to the granted national protection,” the Office’s spokesman Jakub Dudziak told EURACTIV.pl. Over 90% of applications are filed by former Soviet Union citizens, especially from Russia (mostly Chechen and Ingush), Ukraine, Tajikistan, Armenia, and Georgia. Few applications are accepted – annually some 300-500 – while up to 3,000 are rejected and three-quarters remitted because applicants have left Poland before a decision was issued. Most head into Western Europe. Slovakia has always stated it has accepted its 16 refugees not because of the compulsory scheme but on a voluntary basis. It did resettle 145 Assyrian Christians from Iraq in December 2015. Voluntarily of course – and this time not as part of the EU scheme. In December 2015, Bratislava and Budapest filed a lawsuit against the provisional mechanism for the mandatory relocation of asylum seekers. The Court of Justice threw it out in September 2017. The Czechs and Poles didn’t formally join but lent their political support to the legal action. In all four states, majorities oppose admitting refugees. 58% of Czechs think that their country should not accept refugees. In Hungary, 48% said there were no arguments that would convince them to welcome immigrants to the country, according to research by the Friedrich Ebert Stiftung in March. 63% of Poles surveyed don’t want to admit “people that fled from countries involved in military conflicts”. 33% of those surveyed do. Feeding in on that sentiment, in January the Hungarian government proposed the so-called Stop Soros legislative package that would restrict the activities of civil society organisations financed from abroad and which deal with migration. Or how this recently approved Penal Code article puts it, “organising illegal migration”. According to the Hungarian Helsinki Committee’s co-chair Márta Pardavi this legal package turns a political campaign pamphlet and a political goal into law. In her view, penalizing humanitarian and legal aid with imprisonment is unacceptable in a democratic country. Polish voters weren’t always opposed to accepting refugees. In May 2015, a few months before the ruling Law and Justice (PiS) party came to power in October on the back of an anti-refugee campaign, just 21% of Poles were against accepting refugees, 62% were in favour. By the year’s end, Polish sentiments had been turned upside down. Refugees might bring to Europe “various parasites, protozoans that are not a threat for those people’s bodies but might pose a threat here” – PiS leader Jarosław Kaczyński pronounced two weeks before the elections. What has changed is people’s perception of a ‘refugee’. Polls show that people often lack awareness who an asylum seeker is, in the first place. The country of origin of a refugee is very important to public opinion. For example, 75% of Poles surveyed are against accepting refugees from Middle East or Africa, while only 32% don’t want refugees from Eastern Ukraine. What are the V4 solutions for the migration crisis and the potential future ones? They all talk about the need to tackle the root causes of migration. The V4 countries promoted a concept of “flexible’ or “effective solidarity”, during Slovakia’s EU Council presidency in the second half of 2016. It found little support, with the European Parliament’s rapporteur on the migration and asylum file, Cecilia Wikström describing it as “a stupidity beyond all imagination” in June 2017. The same month, Poland’s EU affairs minister Konrad Szymański said that “Member States should be free to choose instruments to demonstrate European solidarity”. “Based on the practice and experience we consider them [compulsory quotas] an ineffective tool that incites secondary movements and acts as a pull factor,” says the Ministry of Interior of the Slovak Republic. Any compulsory redistribution mechanism is a no-go for all V4 states. All four governments say they support reforms to the present asylum system, while opposing automatism and any new supranational solutions. They argue that decisions concerning EU asylum reform should be taken on the level of the European Council so that governments have the right to veto. Last June, Konrad Szymański reminded that Poland unvaryingly opposes “any projects of supranational migration management”, but insisted that “in the context of the refugee crisis Poland offers its participation in almost all European activities”. “We have strengthened Frontex, supported the EU-Turkey deal, we engage financially and technically on external borders. We are ready to develop this type of engagement,” said the Polish Minister. The V4 countries concentrate on two major instruments. According to Czech Prime Minister Andrej Babiš, the first one is assistance “in the place of origin of migration and on migratory routes, in the Middle East, the Balkans, North Africa or Sahel”. The second instrument is improving the protection of external borders. “Frontex and the EU must be active outside Europe,” said Babiš. Creating external hotspots outside of the EU’s territory is a popular idea in the Visegrad countries and could be an acceptable compromise for the whole EU, says Martin Hrabálek, expert on migration at Mendel University in Brno. This opinion was reflected in the June European Summit conclusions mentioning the prospect of establishing “disembarkation platforms” outside Europe for migrants rescued at sea. But first and foremost, European Council agreed that relocations will take place based on a voluntary basis, which effectively spells the end of the mandatory quotas. Another V4 argument – that of strengthening external EU borders and developing Frontex capabilities and mandate – also appeared in the conclusions. And even though “the need to reform the Dublin Regulation was not resolved”, at least this “reform (…) will not be adopted by a majority voting procedure” – Jolanta Szymańska from the Polish Institute of Internal Affairs comments. The V4 countries appear to have succeeding in pulling the EU towards their “flexible” version of solidarity. Although the migration crisis did not hit any of the V4 countries, migration has started to be considered a security issue which makes any debate on the topic very emotional. According to the migration policy expert professor Witold Klaus from the Polish Academy of Sciences and Warsaw University’s Centre of Migration Research, EU asylum reform should be founded on changing the paradigm of perceiving a refugee. “We should come back to looking at these people in the humanitarian context” – he told EURACTIV.pl. That seems very unlikely. Politicians in the V4 have worked hard to ferment anti-refugee and anti-EU sentiments among their citizens. It is little surprise that after the constant paraphrasing of the axiom that EU migration policy is “a ritual suicide”, as the former Slovak Prime Minister Robert Fico put it in January 2016, their efforts are now bearing political fruit.